Here's our classic sticky toffee pudding recipe with gooey caramel, served warm with ice cream or custard for added indulgence. 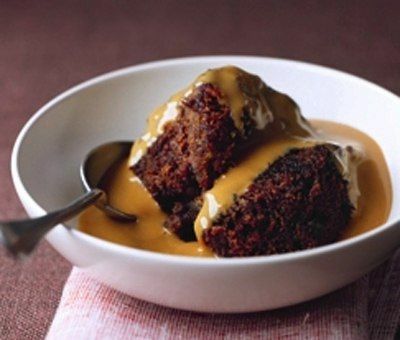 Our tasty Carnation recipe is easy to follow and can be baked within an hour – the result is a scrumptious sticky toffee pudding that is rich in caramel with a sweet and soft texture. 2. Mix the dates and the bicarbonate of soda. Pour the hot water over and leave to soak while you make the batter. Whisk together the buttery baking spread and the sugar, then add eggs, one at a time (don’t worry if it curdles). Mix in the flour, and then stir in the date mixture and vanilla. Pour into the prepared tin. 3. Bake in the oven for about 50 minutes, until springy to the touch and cooked through. 4. To make the sauce: Spoon the caramel into a microwave safe bowl and heat for 1-2 minutes, stirring often (or heat gently on the hob). 5. Serve the pudding warm with a scoop of ice cream or alternatively, heat up some custard and pour over. Add extra caramel sauce for added indulgence. Can you steam these instead?...if so for How long please! Hello Jillian, this delicious pudding is a classic! If you have a steaming function on your oven then the cooking time will be as it is shown on the recipe. Can you make this the day before you need it? Hi Kerry, in our opinion making it the day before gives the sauce a chance to soak in and get all gooey! We suggest pouring half the sauce over the sponge on the day of baking, refrigerate over night and the pop back into the oven for 10 minutes before serving. Pour the last of the sauce over the pudding just before it goes to the table. Can I freeze this pudding? Hi Maria, this pudding will freeze beautifully! Defrost overnight in the fridge and then pop in the oven at 180C(160C with fan)Gas mark 4 for 10 minutes just before serving. Hi Milz, the easiest is to weigh it and then sieve into the other ingredients but it will work wither way. I've baked this recipe so many times now, its a winner everyone loves it!! Instead of caster sugar I use muscovado which makes it a bit richer, lovely!! Hi Kelly, most people aren't even aware that sticky toffee pudding is made with dates because they just cook away. They give the pudding its lovely richness! Hi Asna, we've got some brand new recipes on the site! Why not try our new Baked Raspberry Cheesecake or Millionaire's Salted Caramel Tart? Do you have a conversion chart for us Americans? Hi June, thanks for spotting this - we've now amended this. Happy baking! Sticky Toffee Pudding Recipe is rated 4.0 out of 5 by 5. Rated 1 out of 5 by haventgotone from Confused I am reviewing the recipe for sticky toffee pudding. The star isn't because I've tried to make the pudding it is because I've tried to understand the recipe. The recipe is confusing. First you bake a pudding in the oven. Then all of a sudden , having reached for THE tin of condensed milk you have a lovely caramel sauce without any explanation. Then what happens to the sauce? Apparently you bake the pudding again and then forget about the toffee sauce and serve it up with custard or ice cream. Too confusing. I would have expected better from a traditional own brand recipe collection. Rated 4 out of 5 by Andy from Winter pud! Snowing today searching through cupboard for something for pud after Sunday lunch and found tin of caramel and dates. Sticky toffee pudding recipe was found on this site and a delightful pudding was made. Went down well with all the family. Rated 5 out of 5 by Marci from AMAZING I made this for a big family get together. Doubled recipe, worked perfectly. I always give them the choice of cram or Caramel Sauce. So they have both usually. Its such a favourite and much quicker than my old way of doing it. Rated 5 out of 5 by fyh1427 from Perfect every time! This recipe is definitely a keeper. Have made it so many times, comes out perfect every time. It's a hit with everyone, young and old. Thank you.